The Stratfor report rumored that a possible Coup-de-Etat was possible in the Philippines in the last months of 1999. How would the Philippine Marines be involved in this event? It is quite a coincidence that ten years ago the last and most serious challenge to the newly restored Philippine Democracy occurred in December 1989. After careful planning, the coup plotters were able to turn an obstacle into an asset in their favor. 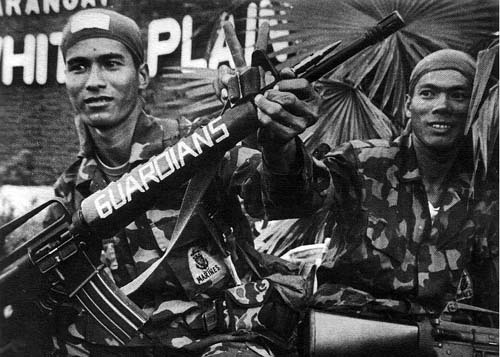 In previous coup attempts the Philippine Marines responded by remaining loyal to the elected civilian government and combating the rebel forces in several attempts that marked the Presidency of Corazon Aquino. The term "loyalist" was used before this to mean organizations and forces loyal to former President Ferdinand Marcos who was in a sponsored US exile in Hawaii. The Philippine Marines would maintain a Battalion of Marines in the Metro- Manila area also called the National Capital Region. A Marine Battalion would be rotated in every year for training and refurbishment. They would also serve as the marching units for parades and ceremonies. Part of their training included joint exercises with US military units. With the threat of military coup attempts by other units of the Armed Forces the Marine Training Battalion was made a component of the National Capital Defense Command was organized as an Command structure to defend the center of government, business and communication. The Marines being a small cohesive unit, personal relations form a bond among the personnel and officers. This is beneficial for obtaining assistance during times of need. On this occasion the Marine officer said to be a "Marcos loyalist" was full Colonel in charge of operations (G-3) for the Marines. The present commanding officer of the training battalion (4th Marine Battalion) was previously one of the staff officers of this Colonel in the 10th Marine Battalion in 1984. The 4th Marine Battalion was scheduled to participate in a joint exercise with a visiting USMC unit in Subic bay that included an amphibious landing. The battalion was standing by awaiting orders to move out for the exercise from the G-3 Operations office. It had men, ammunition, supporting armor (V-150 Commando armored car, LVTP-5 / LVTH-6 Howitzer, amphibious personnel and fire support armored vehicles.) waiting to go. While the Marine Commandant at the time Brigadier General Edgardo Cabanlig was wondering about the status of his units in face of the Coup alert from higher headquarters. Some members of his staff had been turned by the Marine officers sympathetic to the RAM and YOU movement that had been responsible for previous coup attempts. In the confusion, the 4th Marine battalion that was reserved for the defense of the government had been "turned to the other side" by co-opting its officers. However with the exception of one officer, the Battalion S-3 (Operations). He was in the wardroom with the other officers working on other details for the scheduled joint exercise when the "G-3 Colonel" came in and told the Battalion Commander in front of his staff , " Remember what we talked about! Rebel Marine with "Guardians" spelled out on the hand guard of his rifle. The Guardians were an organization that organized the enlisted personnel of the Armed Froces of the Philippines as a counterpart of the RAM and YOU officer organizations. Then the Colonel departed as briefly as he appeared. Suspicious of what the G-3 had meant, he asked his Battalion CO. The COs answer was evasive and the S-3 a Marine Captain went to the Commandants headquarters to inquire what changes there may to the operation plans that he was responsible for. On the way her he noticed that some personnel were fully armed and wearing identification flashes or armbands on their uniforms while still inside camp. While sorting through the confusion of the headquarters, the Captain called back to his office to discover that the Battalion was moving out. The Coup had begun. The Marines in the Battalion followed the orders from their officers to move out. Thinking they were finally leaving for the joint exercise with the USMC they were happy to get on their way. Not knowing they were going to be in combat in a few minutes by attacking the Philippine Airforce headquarters (Villamor formerly Nichols Airbase) across the South Superhighway from the Marine Base in Fort Bonifacio. The clue that something may have been wrong was the large LVTs or Amtracks were used to break open the side gates from the Marine Barracks and head out to the highway. Since as a precaution, the guards had secured the main gate were told to stop and report any movement in or out of the camp to the Commandants office. Within hours the 4th Marine Battalion had taken its objective and secured the Airforce Headquarters and aircraft on the base. From there they could control the International Airport of Manila. 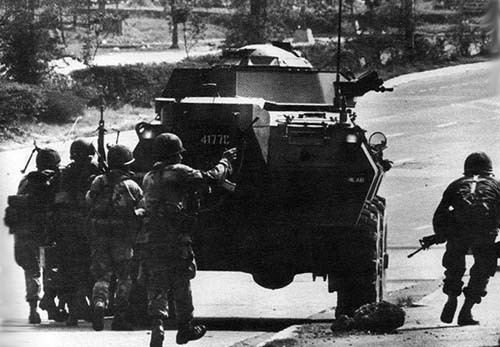 Marines advance behind V-150 Armored Car outside Camp Aguinaldo clossing in on rebel units. 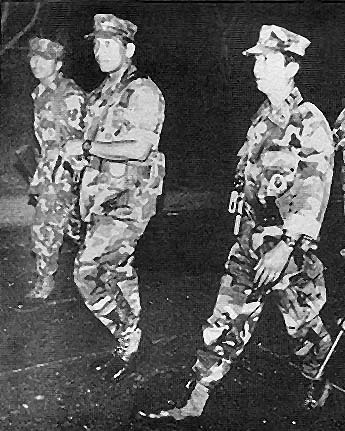 The Marine Captain who did not join his Battalion would lead other Marines to against his own men and other units of that had joined the 1989 Coup. Brother would fight against brother Marine in the next seven days. See page 26 in Gallant Warriors From the Sea; The Philippine Marine Corps Today. 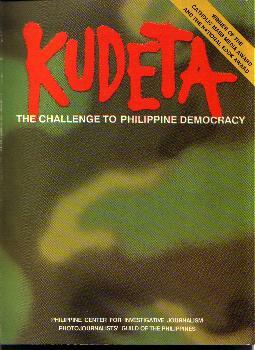 KUDETA is a photo-documentary of the events that led to the coup and a day to day account. It was produced by the Philippine Center for Investigative Journalism (PCIJ) and published by Bookmark. AVA Sales and Services, PoBox 21104, Oxnard, CA, 93034, USA. Softcover 8"X12", 230 pages, B&W photos. In Manila, copies are for sale at the Armed Forces Museum gift shop, Camp Aguinaldo, Quezon City.